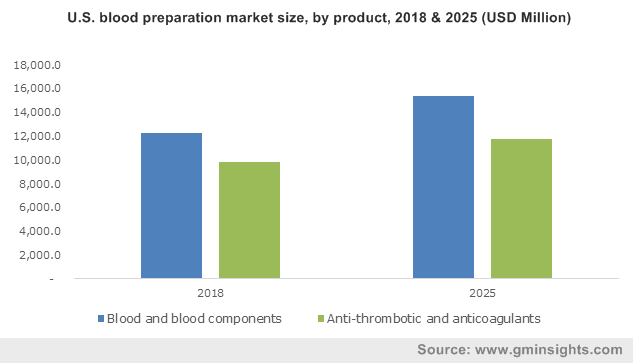 Blood Preparation Market size was valued over USD 60 billion in 2018 and is expected to witness more than 3.5% CAGR from 2019 to 2025. Rising prevalence of blood related disorders requiring blood transfusion will act as high impact rendering factor for blood preparation market growth during the forecast timeframe. Outbreak of infectious diseases such as dengue fever leads to rise in demand for platelet products and transfusion. South-east Asian countries such as Indonesia, India, Thailand and Myanmar are at highest risk of disease incidence. Strong product pipeline of anti-thrombotic and anticoagulant drugs coupled with rising awareness about blood donation in developing countries should propel industry growth. Furthermore, increasing number of road and occupational accidents should stimulate demand for blood and blood components leading to business growth. Blood and blood components market accounted for more than 55% market share of global blood preparation market in 2018 due to increasing application of blood components and rising prevalence of bleeding disorders requiring blood transfusion. Anti-thrombotic and anticoagulants market is anticipated to witness 3.5% CAGR over the forecast timeframe owing to growing adoption of anti-thrombotic drugs to reduce mortality due to thrombosis. As per NIH 2018 data, nearly 100,000 to 300,000 people in the U.S. die due to venous thrombosis annually. Increasing investment towards development of innovative anti-coagulant drugs should drive anti-coagulants market. Newly developed anticoagulant drugs include factor Xa inhibitor, tissue factor inhibitor, direct thrombin inhibitor, factor IX inhibitor, and novel vitamin K antagonists. Based on application, the blood preparation industry is segmented into renal impairment, thrombocytosis, angina blood vessel complications and others. Pulmonary embolism (PE) and thrombocytosis markets together accounted for more than 40% market share in 2018. High incidence rate of these conditions coupled with continued clinical research studies in hematology should drive segment growth. Angina blood vessel complication segment is set witness 4.3% CAGR during the forecast period owing to increasing incidences of cardiac conditions resulting in less oxygen supply to the heart. U.S. blood preparation market dominated the industry in 2018 by accounting more than 35% market share of global blood preparation market. Well developed healthcare infrastructure, high patient awareness levels and growing incidences of thrombocytosis should drive U.S. blood preparation market. The Center for Biologics Evaluation and Research (CBER) controls and establishes standards for collection of blood & blood components used for transfusion or for manufacturing pharmaceuticals products from blood and its components in the country. 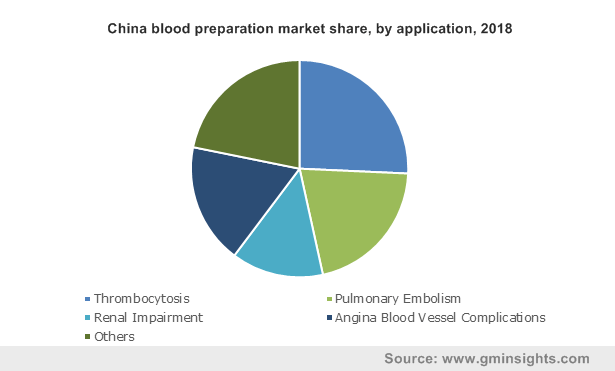 China blood preparation market will experience significant growth of 4.8% over the forecast period. Increasing number of baby boomers, growing incidences of blood-related disorders and numerous initiatives taken by government to escalate number of blood donations should propel Chinese blood preparation market growth. 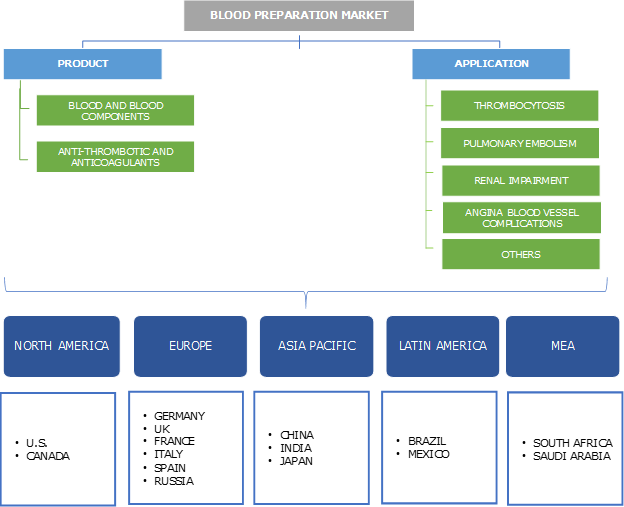 Some of the notable industry players operating in blood preparation market comprises of Pfizer, Bayer, Aralez Pharmaceuticals, GlaxoSmithKline, Boehringer Ingelheim, AstraZeneca, Leo Pharma, Bristol-Myers, Ionis Pharmaceuticals, Johnson and Johnson and Daiichi Sankyo. Companies are focusing on R&D for developing highly efficient and cost-effective anti-coagulant drugs to treat various blood related conditions. Companies are entering into strategic collaboration and partnership to increase their customer base as well as strengthen their product portfolio. For instance, Pfizer entered into collaboration with Bristol-Myers Squibb to commercialize and develop anticoagulants and metabolic compounds. Blood preparation industry has been experiencing growth since 1947, the scientists have been conducting research to develop superior blood anti-coagulants. Blood preparation industry possess strong product pipeline. Companies are also focusing on developing drugs required to reverse anticoagulation. For instance, In May 2018, U.S. FDA approved Andexxa, antidote for the Reversal of Factor Xa Inhibitors developed by Portola Pharmaceuticals. Moreover, introduction of new oral anticoagulants in the market will lead to lucrative market growth in near future. Companies are investing heavily in R&D to develop superior anticoagulants to fulfil growing demand as well as gain significant market share especially in developing countries of Asia Pacific. Expanded applications of blood derivatives in aesthetic procedures such as anti-aging therapy should further stimulate business growth.